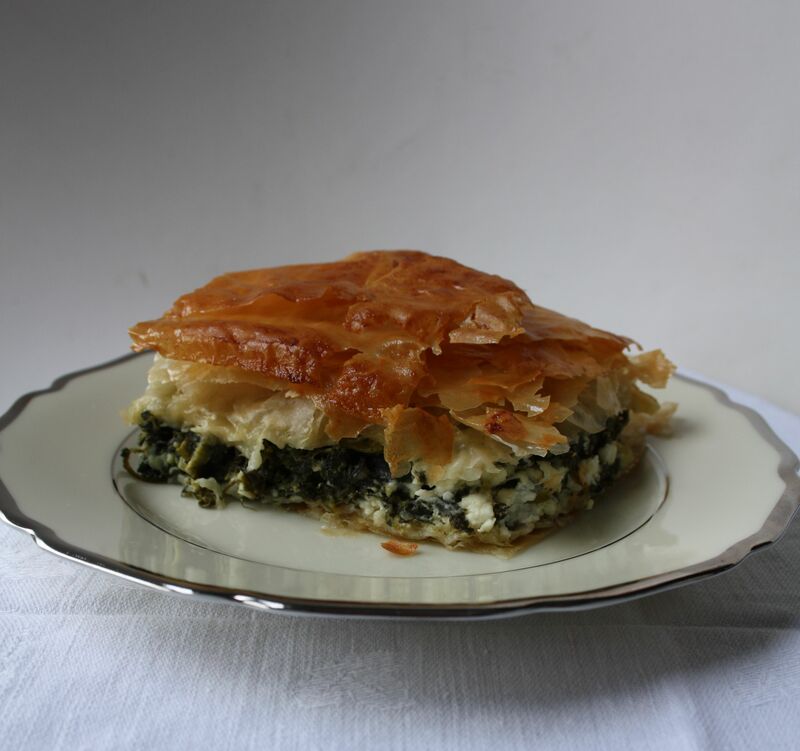 Spanakopita is a special dish for me, it takes me right back to Athens, Greece and my wedding. The week before and the run up to the wedding was chaos, the dress needed last minute altering, communication over the flowers had been misunderstood and everything was unraveling fast. It was turning into a Greek tragedy with my mother playing the leading role. Perhaps it might be a little unfair but I am sure on occasions she could be seen from the side lines fanning the flames! We stayed with Lela and Andreas. I had known them nearly all of my life. Lela had been my mother’s childhood friend. Their house had changed dramatically over the years but the garden remained the same. A little oasis of green that wrapped around the house. On one side of the garden under the shade of a tree sat a large red swing sofa, trimmed with a thick white fringe, which continued onto the matching canopy. I can remember in previous years spending many a happy hour in the afternoon heat laying across it shaded by the canopy and swinging back and forth daydreaming. As the week wore on problems and hitches only seemed to get larger and the hands on the clock seem to move in double time. I was beginning to wish that I was somewhere else perhaps back daydreaming on the swing sofa. Andreas sensing all the friction and chaos on the day before the wedding announced that he would cook lunch for all of us. He would create something we would all love. He called me into the kitchen as he wanted to show me how he made his Spanakopita. It was the first time I had seen it made and for the next hour all my problems outside that kitchen melted away. Andreas pointed out the key factors to me, making sure I was taking it in, and I did, that recipe has served me very well over the years. I have made his recipe countless times over and each time, I think of him and that morning of when calm entered back into my life. Needless to say we all loved eating Andrea’s spanakopita and it remains the only thing I remember eating that entire week. 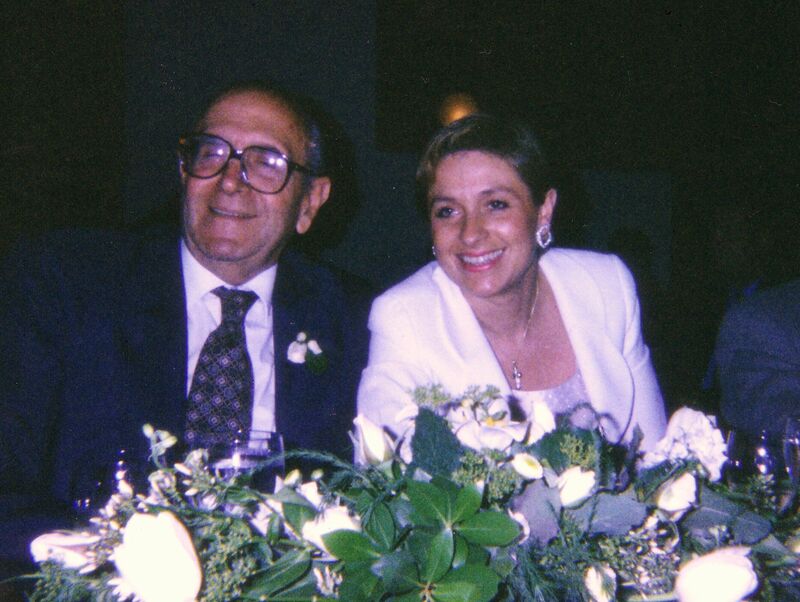 Andreas and Valia (my koumera). Wash the spinach well and drain. Bring a large pan of salted water to the boil and drop in the spinach, leave until the spinach wilts – this will take about a minute or two. If you can’t fit all the spinach in the pan at once, cook it in batches. Drain and allow to cool, you will be surprised how much water will drain out. Give the spinach a good squeeze to release as much liquid as possible. In a bowl beat the two eggs, add to this the finely chopped spring onions and crumble in the feta cheese. This can be done by hand, nothing needs to be uniform. Add the dill or parsley, if using, and then the drained spinach along with salt and pepper to taste. Mix well using your hands. 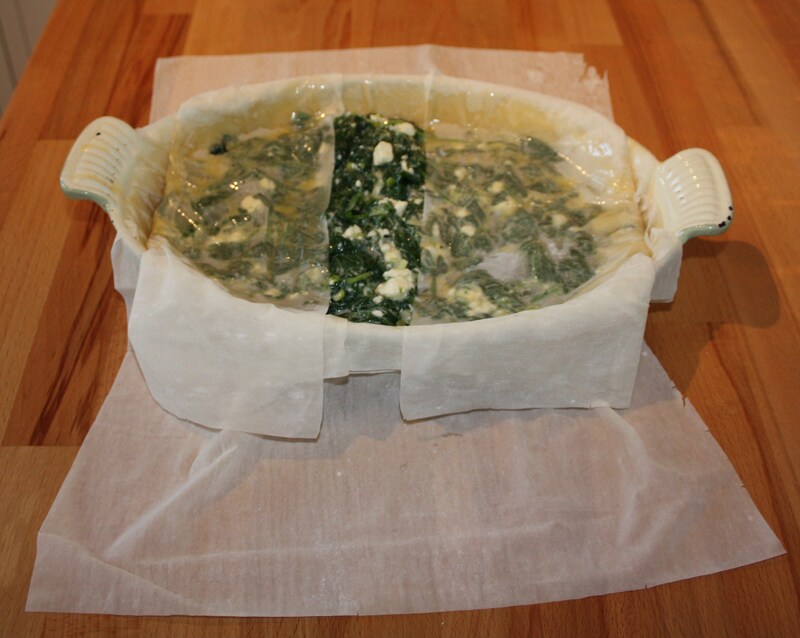 Spanakopita is traditionally made in large round flat aluminum dishes. I prefer a cast iron dish, it’s all personal choice. Some people use a glass oven proof dish. The filo pastry is very thin and so will dry out very quickly. 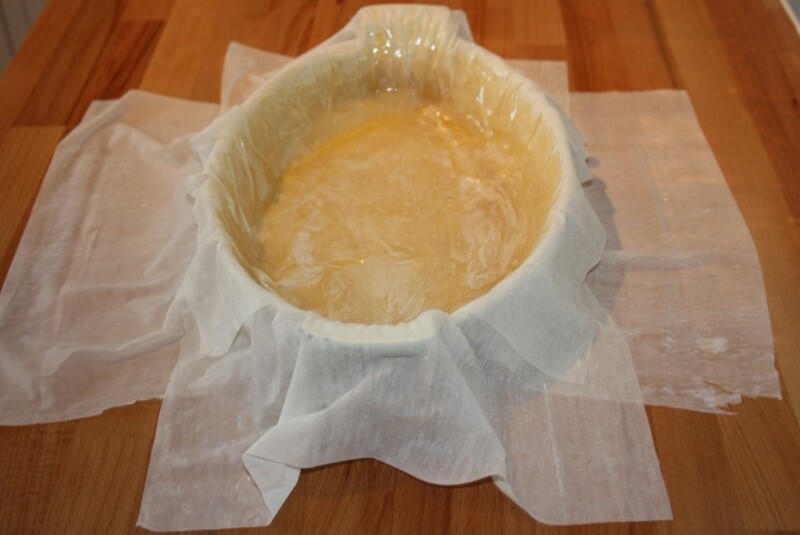 To stop this happening put a damp cloth over the pastry whilst you are not using it. Also when laying the filo sheets don’t go off and answer the phone or make a cup of coffee. It needs to be done quickly and in one go. The filo pastry needs to be brushed with either olive oil or melted butter. There is no fixed rule here, its down to purely personal choice but there is a difference in taste, albeit a subtle one but still a difference. If using butter, it needs to be melted in a pan over low heat or in a microwave being careful not to burn it. First, brush the baking container liberally with the oil or melted butter, then start to layer the filo, brushing each top side of pastry as you go. Start by laying the first sheet of filo pastry over the bottom of the dish allowing it to overlap the edge of the dish. Now repeat again allowing it to overlap on the opposite side of the dish. Do the same again for the top and bottom of the dish forming a cross. Add the spinach mixture making sure it is spread evenly over the dish. Now, start to fold the filo back over the spinach mixture making sure to brush the top of the pastry sheet with oil/butter. To add more height brush a new sheet of filo with oil/butter and fold in half and place on top, tucking in any excess pastry. I usually add two to three extra sheets depending on my mood. Finally brush the top sheet with the melted butter/oil and put into the middle of the oven 350/180 Gas mark 4. 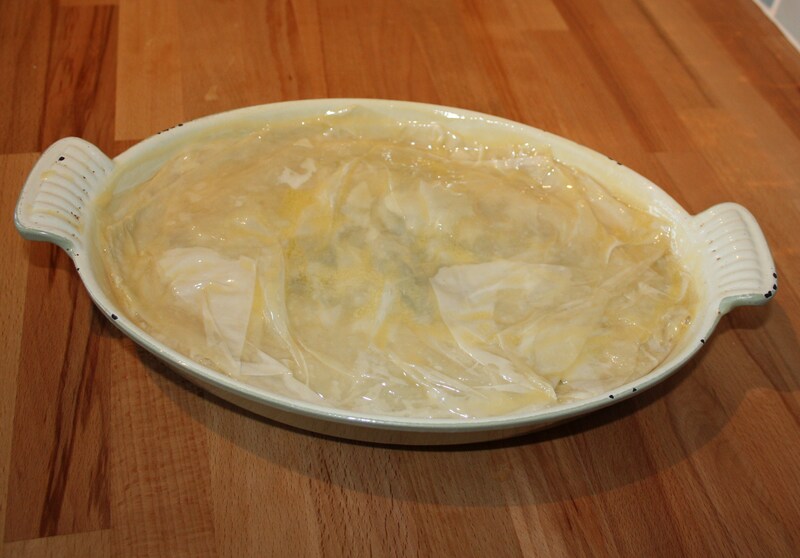 After 40/50 mins check to see if the filo is a golden brown – if not leave a little longer. Remove and leave for a minute or two then with a sharp knife cut the pie into portions. Spanakopita can be served hot or cold. I love it just warm served with a salad. I have also found it can be re-heated in the oven but not in a microwave. It really needs to be eaten fresh. Note: Frozen spinach can be used but for me there is no substitute for the fresh ingredient and now it seems it’s available all year round so there is no excuse. Perhaps I should put it a little more bluntly – if I had the choice between frozen spinach or no lunch it would be the no lunch option.